Balasore(PTI): India today successfully test-fired its nuclear capable surface-to-surface ballistic missile Agni-5 – the most advanced missile in the Agni series with a strike range of over 5000 kms — from a test range off Odisha coast. The user associate test-flight of the missile has further boosted indigenous missile capabilities and deterrence strength of the country. All radars, tracking systems and range stations monitored the flight performance, defence sources said. Describing the trial as “fully successful”, the sources said, the sophisticated missile travelled for 19 minutes and covered 4,900 km. The sleek missile was test-fired from a canister launcher, mounted on a mobile platform, at about 9.54 am from No. 4 launch pad of the Integrated Test Range (ITR) in Abdul Kalam Island, earlier known as Wheeler Island, they said. After four successful developmental trials, this was the first user associate test of Agni-5 missile, the sources added. ‘Agni-5 is most advanced missile in the Agni series with new technologies incorporated in it in terms of navigation and guidance, warhead and engine. It has a range of over 5000 km. “The redundant Navigation systems, very high accuracy Ring Laser Gyro based Inertial Navigation System (RINS) and the most modern and accurate Micro Navigation System (MINS) had ensured the missile reached the target point within few metres of accuracy. “The high speed on board computer and fault tolerant software along with robust and reliable bus guided the missile flawlessly, said an official of Defence Research and Development Organization (DRDO). The missile is so programmed that after reaching the peak of its trajectory it will turn towards Earth to continue its journey towards the intended target with an increased speed due to the attraction of the earth s gravitational pull, he said. Its path is precisely directed by the advanced on-board computer and inertial navigation system, the official added. 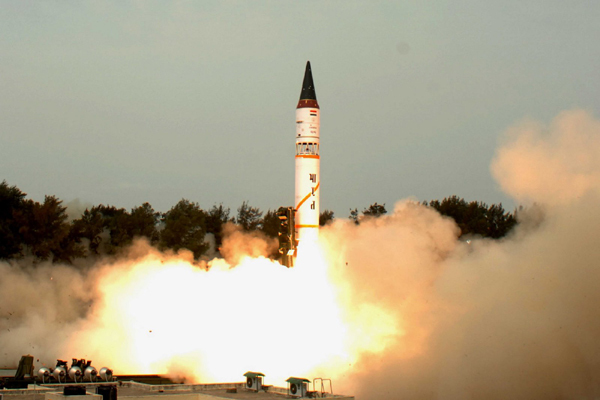 The first two successful flights of Agni-5 in 2012 and 2013 were in open configuration. The third, fourth and today s launch from a canister, integrated with a mobile sophisticated launcher, were in its deliverable configuration that enables launch of the missile with a very short preparation time as compared to an open configuration. It also has advantages of higher reliability, longer shelf life, less maintenance and enhanced mobility. India has at present in its armoury of Agni series, Agni-1 with 700 km range, Agni-2 with 2000 km range, Agni-3 and Agni-4 with 2500 km to more than 3500km range. The first test of Agni-5 was conducted on April 19, 2012, the second on September 15, 2013, the third on January 31, 2015 and fourth trial on December 26, 2016 from the same base.